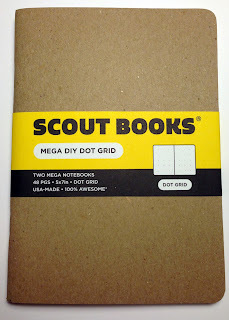 After my previous, two-part review of Scout Books Sketch Keeper notebooks (here and here), the fine folks at Scout books were kind enough to send me some of their Mega DIY notebooks to try out. I was really excited when I received them in the mail, but have failed to give them a proper review on the site (sorry Scout Books). Some of what I discussed previously still applies, but there are some differences that I found really great. Let's get down to why I really, really prefer the Mega series of Scout Books to the standard version... Size and branding. I have mentioned before that I have issues when it comes to sketchbooks. I have this strange desire for everything that fills my sketchbooks to be perfect. As a result, I hesitate to actually *draw* in my sketchbooks. Ugh. I feel like I am wasting some precious resource when I just doodle or take notes in a standard sketchbook. Wait, it's because I am wasting something... Money. Sketchbooks are freaking expensive, don't usually lay flat and are either too small or gigantic. 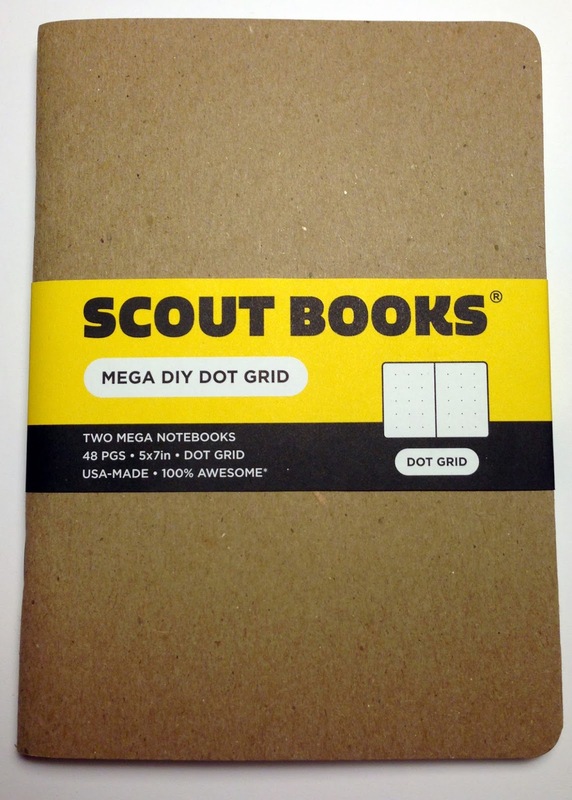 These Mega DIY notebooks are none of these things. I sketch fairly large when I draw. Even my "thumbnail" sketches are more like a palm size. This makes the smaller notebooks less convenient to draw in. I like them for jotting notes, but when it comes to sketching, I'm sold on the Mega series. I come from the "less is more" school of design. 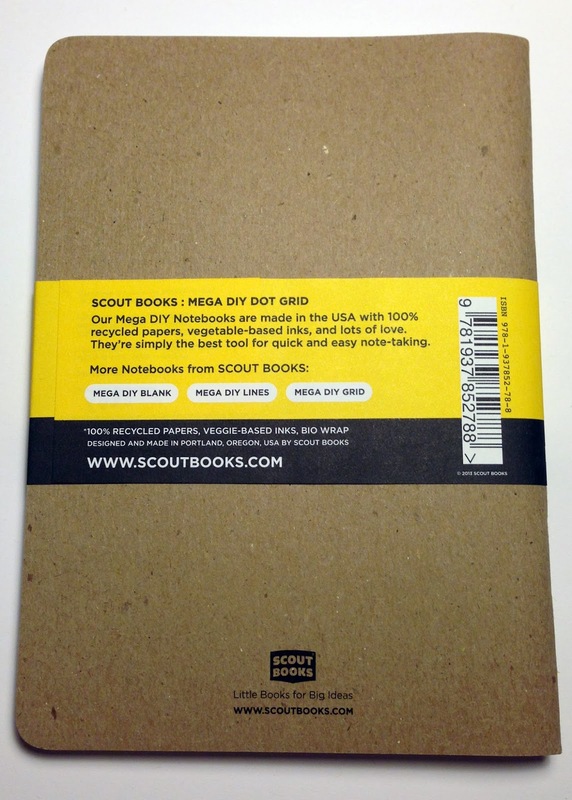 So, when I opened my package from Scout Books and found that my new notebooks only had a small logo on the back cover, I was stoked. All that blank space to doodle or just to enjoy the simplicity of the cover is just right. Perfect. 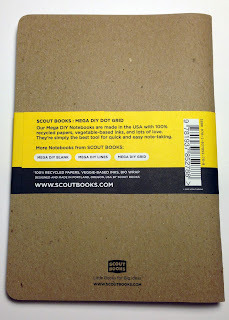 Good job on that one Scout Books. I am actually more likely to tell others about this product for this reason alone. I will probably be buying a few more of these in the blank configuration just to have around because they are perfect for sketching. They have great paper, are inexpensive, and you won't feel bad if you lose one. Hopefully they will offer them in a box set like the standard notebooks so that the designer/illustrator/artist types can collect and store them in an organized manner. Either way, go their site and check them out! 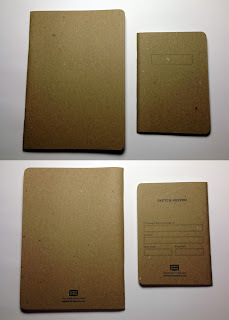 These notebooks are very well made and are a very good value (2 for $10 with free shipping!). Heavy, bright paper takes ink well and resists curling. Plain overall appearance makes customizing easy. Larger size is ideal for sketching and drawing. Doesn't come in the larger box sets like the standard notebooks (not much of a con, really).